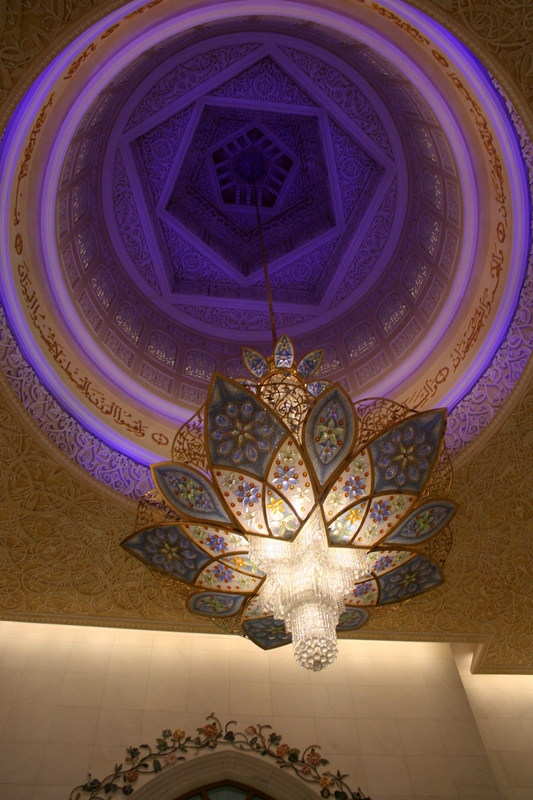 “Ma’salama.” Sheikh Zayed Grand Mosque, Abu Dhabi, United Arab Emirates, 2 April 2011. 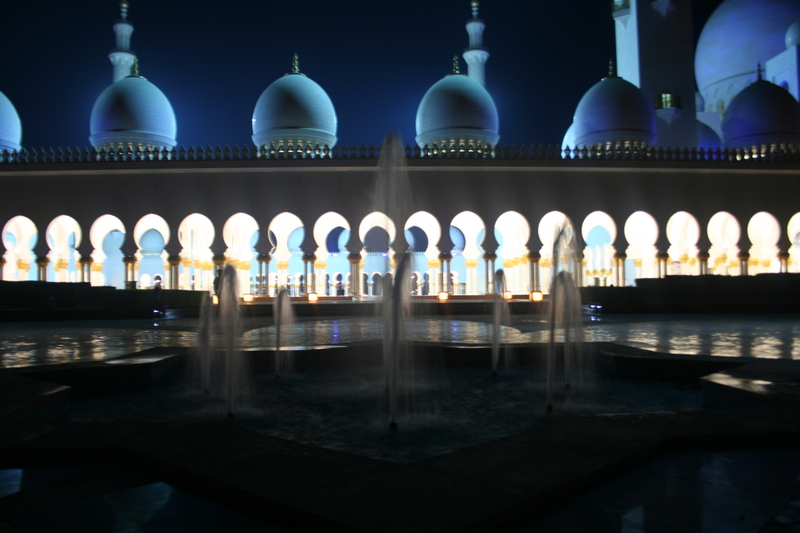 One of the first things I did when I arrived in the UAE more than two years ago was to visit the Sheikh Zayed Grand Mosque. People here like to throw around the superlatives — largest pearl sold at auction, tallest building, most expensive Christmas tree — and while all these superlatives are well earned, they still sometimes feel gratuitous. 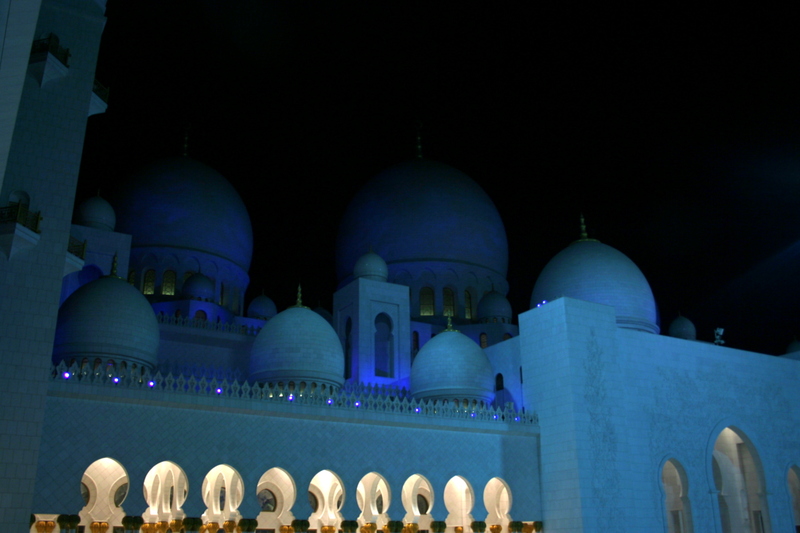 But the Sheikh Zayed Grand Mosque serenely transcends the hype and is indeed a remarkable marvel of architecture, at once classical and modern, a perfect stylistic balance of ornate and meditative, massive but inviting. It’s a beautiful building. 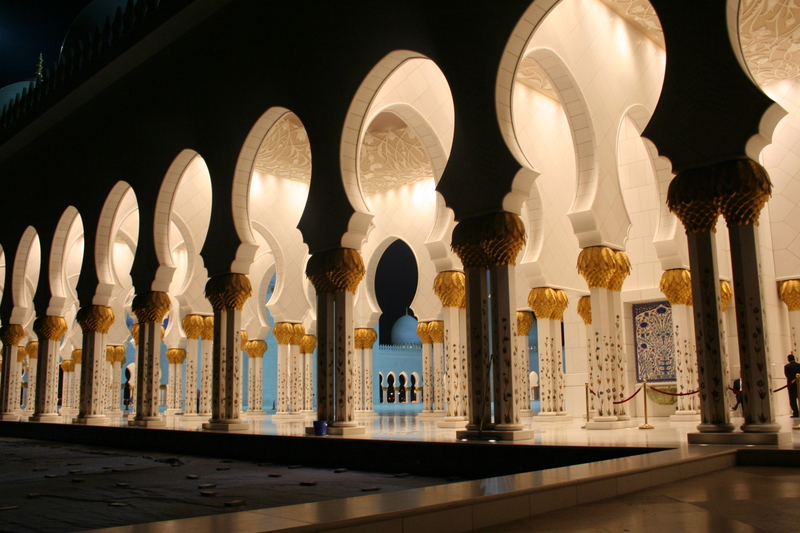 Shortly after my first visit, as a tourist, I accompanied a group of my students on a field trip to the Grand Mosque so they could compare its architecture and functionality to the Mughal architecture of the Taj Mahal, which served as one inspiration for the Grand Mosque. 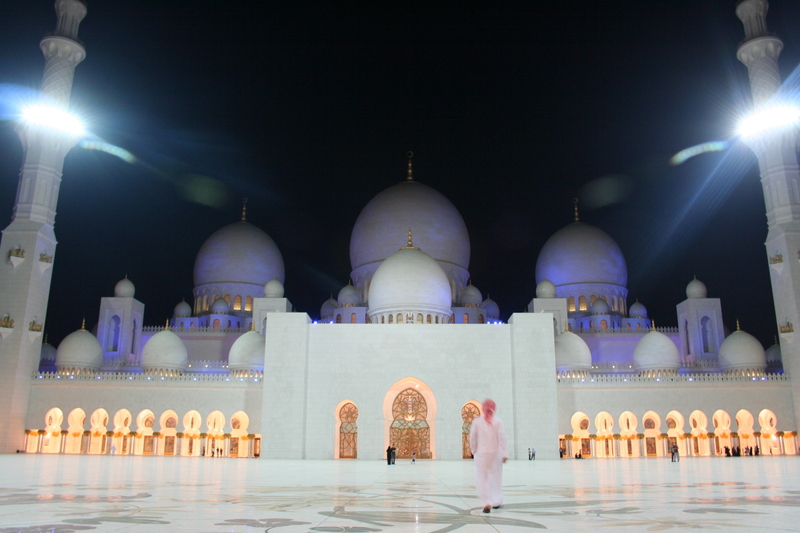 The mosque looked no less impressive on a second viewing than it had on the first. And in these past two years, I never failed to crane my neck and gaze at it as we passed on the highway or ate dinner at one of the restaurants across the water from it. 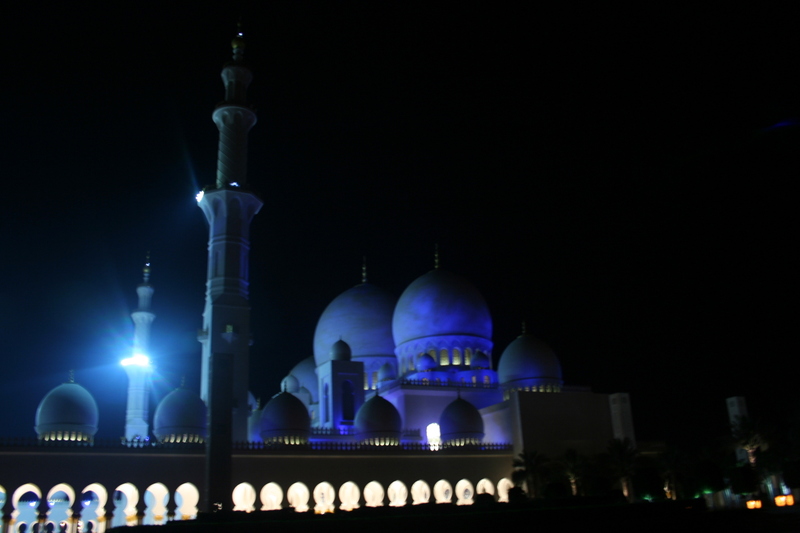 But in these two years, I had yet to visit the mosque at night, when its polished marble domes are illuminated in a soft, ethereal blue light and the huge inner courtyard gleams under the floodlights on the minarets. 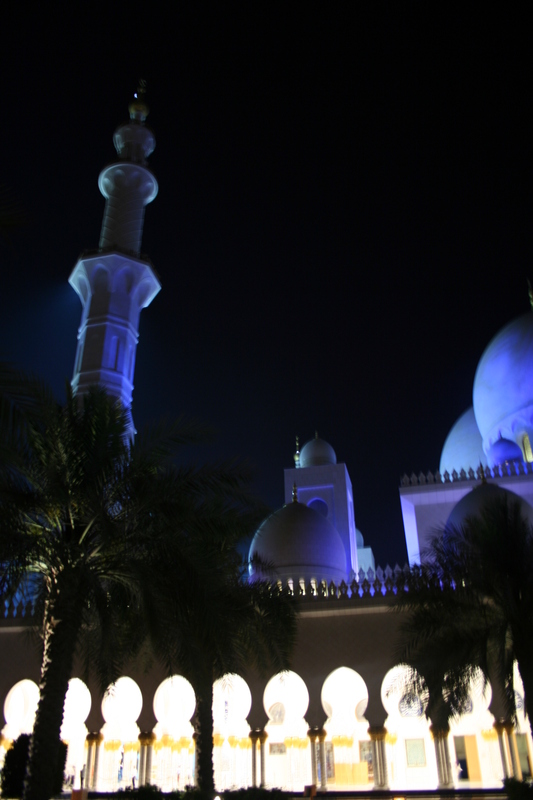 This is my final week in Abu Dhabi. Next week, I’ll fly back to the States, ahead of my wife, to start the next chapter in our lives. 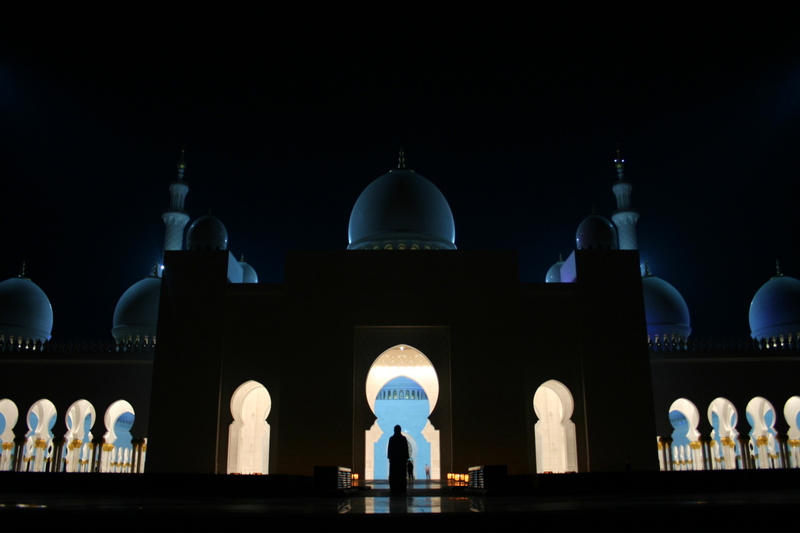 And so my wife and I agreed that my farewell to the city that has been our home these past few years could not be complete without a final visit to the Sheikh Zayed Grand Mosque, and what better way to bid this magnificent building goodbye than to see it at night? 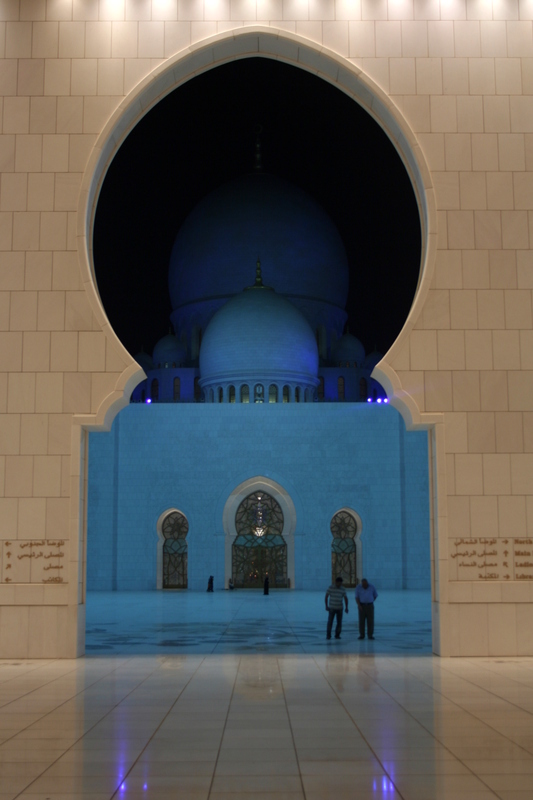 In case you’re curious, the Arabic word “ma’salama” means goodbye, but I understand that its more literal translation is “go with safety.” In usage, it’s something very like the English word “farewell.” And so Abu Dhabi and I bid each other farewell. Thanks for all the great memories, UAE. I look forward to sharing what I’ve experienced here with all my friends and family back in the US. 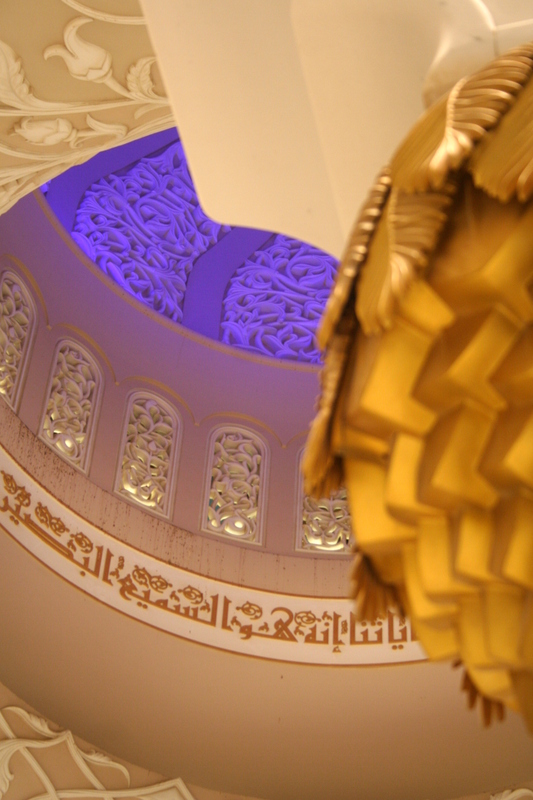 Especially the beauty of this wonderful mosque.